I’ve always been a pistachio girl. Whether it’s gelato, ice cream, macarons or muffins, if it’s pistachio flavor, I’m getting it. Last week I had the privilege of traveling to Paris with my boyfriend Adam and his sister Lindsey. Adam won a travel fellowship through school to study art nouveau, so naturally Lindsey and I jumped on board at the opportunity to go to Paris. While it was not my first time in Paris, I found myself falling in love with the city all over again. Since Adam was studying architecture we walked around, exploring every nook and cranny of the city, most days averaging over 15 miles of walking (close to 35,000 steps a day!) While Paris left me in awe (and downright exhausted), I found the trip to be weirdly therapeutic. As a routine-obsessed freak, it was incredibly refreshing not to have every aspect of our trip planned. I didn’t worry about what our agenda was going to be each day, or how I was going to find healthy foods in France or check my email every hour, I just lived. These Gluten-Free Pistachio Muffins we’re inspired by a muffin that Lindsey and I tried from an Eric Kayser bakery (if you live in NYC look for Maison Kayser, we’re obsessed!) 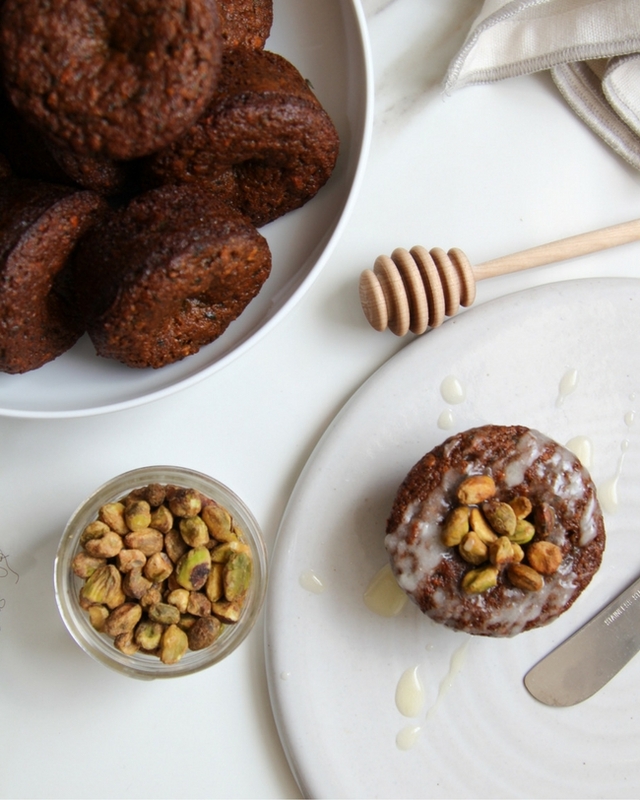 While Eric’s muffins were chock-full of butter, sugar and all things magical in this world, my pistachio muffins take a slightly healthier twist. Made gluten-free with almond flour (available at most grocery stores), these heavenly muffins are made with healthy ingredients such as eggs, honey, pistachios, spinach, almond extract, coconut oil and salt and can be prepared in minutes! Prendre plaisir - Enjoy! 1. Preheat the oven to 350 degrees F. and grease a 12-cavity muffin pan lightly with coconut oil. 2. Place all of the ingredients into a large bowl and mix well. 3. Using a spoon, fill each cavity of the muffin tin 3/4 of the way full. Use your finger to smooth the batter at the top of each muffin before placing in the oven. 5. Optional Glaze: Place all of the ingredients into a small bowl and mix well. Drizzle glaze over each cooked muffin and top with pistachios as desired. For best results, refrigerate or freeze muffins.